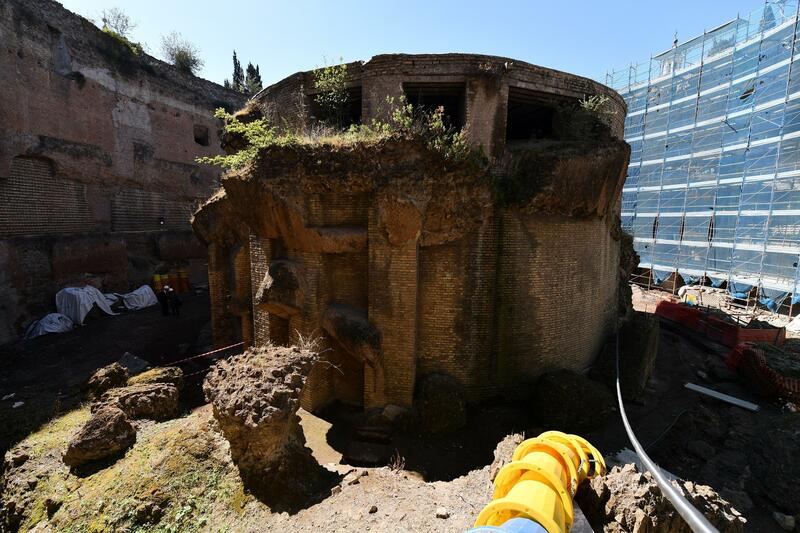 Remember when I wrote that article on the history of the Mausoleum of Augustus, how it got to its current derelict condition and how the mayor of Rome planned to get a restoration started by the end of the year to coincide with the 2000th anniversary of Augustus’ death? That was 2014. The restoration did not get started by the end of 2014. Nor by the end of 2015. Or 2016. But at long last, the Mausoleum’s day has finally dawned. The old mayor, Ignazio Marino, is gone and the new mayor, Virginia Raggi, officially inaugurated the 10-million-euro ($10.9 million) restoration project on Tuesday. Six million of the total cost was raised from a private donor, not the mysterious Saudi prince who was bandied about by the former mayor as a potential funding source, but the Italian telecom brand TIM. The rest of the money was contributed by the city of Rome and Italy’s culture ministry. 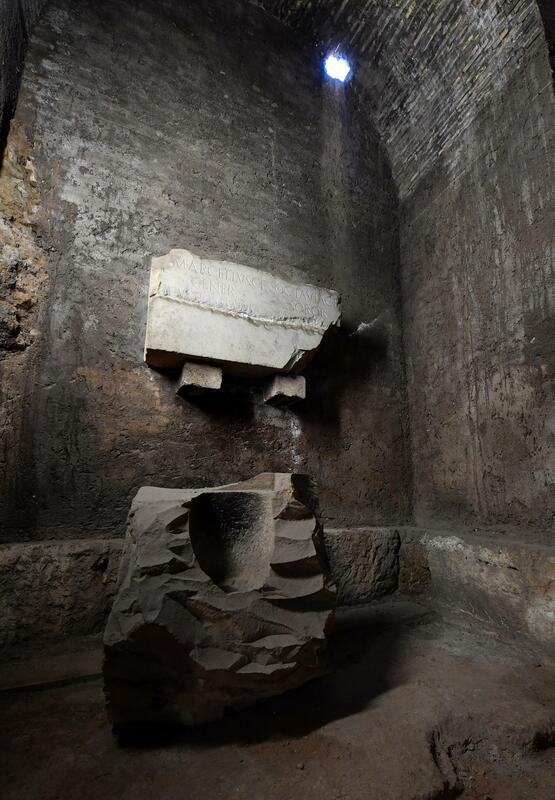 The refurbishment, which will end in a grand reopening in April 2019, will include 3-D effects and the restoration of the 13,000 square metres of a monument that is even bigger than the famed Castel Sant-Angelo, built over the tomb of a later emperor, Hadrian. The project represents a “model of public and private collaboration we hope will become a model,” said Raggi. It doesn’t look bigger than Castel Sant’Angelo today, but when Augustus built it when he returned to Rome in 31 B.C. after his final defeat of Mark Anthony at the Battle of Actium, its grandeur was without parallel. It had a lot of competition because the Campus Martius, the “Field of Mars” where troops mustered and tribes gathered to vote just outside the pomerium, the city’s ancient religious boundary, had become a popular location for new temples, public buildings, artworks and the tombs of the rich and noble. 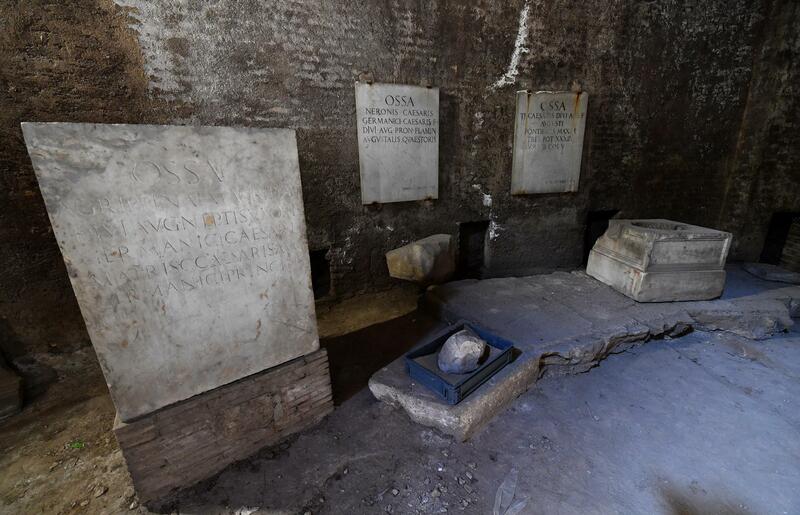 Now the sole ruler of Rome, Augustus planned his Mausoleum to contain his ashes and those of his whole family. Made of brick clad in white marble, the interior had a vaulted ceiling and separate corridors for each family member. The entry was flanked by two pink granite obelisks Augustus looted from Egypt, and an earthen tumulus planted with cypresses topped the roof. When it was finished in 28 B.C., the Mausoleum was 295 feet in diameter and an estimated 137 feet high. Everyone who was anyone in the Julio-Claudian line — minus Augustus’ disgraced daughter Julia, her disgraced daughter Julia and the Emperor Nero who was buried in the tomb of his paternal family — was buried in the Mausoleum, and it was one of the great icons of Rome until the 5th century when the Visigoths plundered it. Following in the Visigoths’ footsteps were the usual suspects of late ancient and medieval Rome — popes and endlessly squabbling Roman nobles — who stripped the building of its marble and converted it into a fortress. That’s what happened to Castel Sant’Angelo, formerly the mausoleum of the Emperor Hadrian, too, but Castel Sant’Angelo remained in use as a papal fortress and prison for centuries, while the fortifications of Augustus’ tomb were destroyed during a petty war between noble families only decades later. Stripping the fortress left the Mausoleum in a ruinous state. It found new life in the Renaissance as a sculpture garden, amphitheater, a sort of sideshow spectacle venue, and in the early 20th century, an Art Nouveau theater. Then came Benito Mussolini. 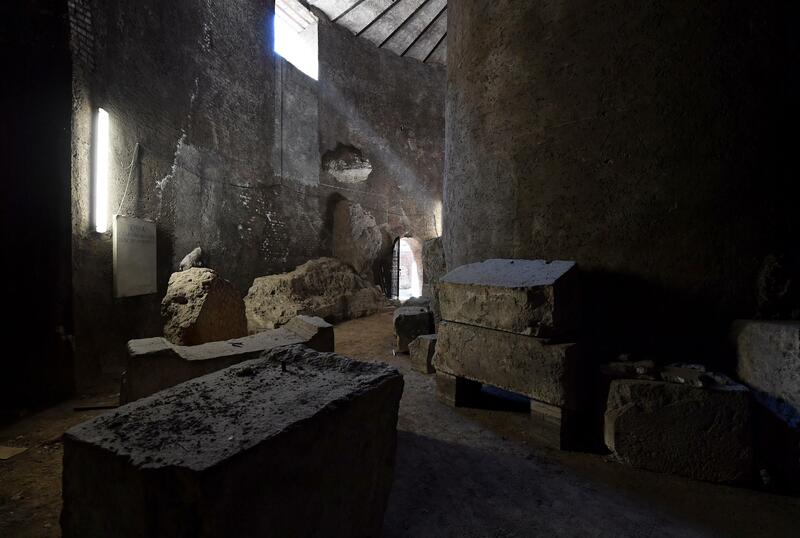 In 1936, he decided he’d return the Mausoleum to its true Roman origins and tore down all the later additions and modifications, leaving the original brick walls. 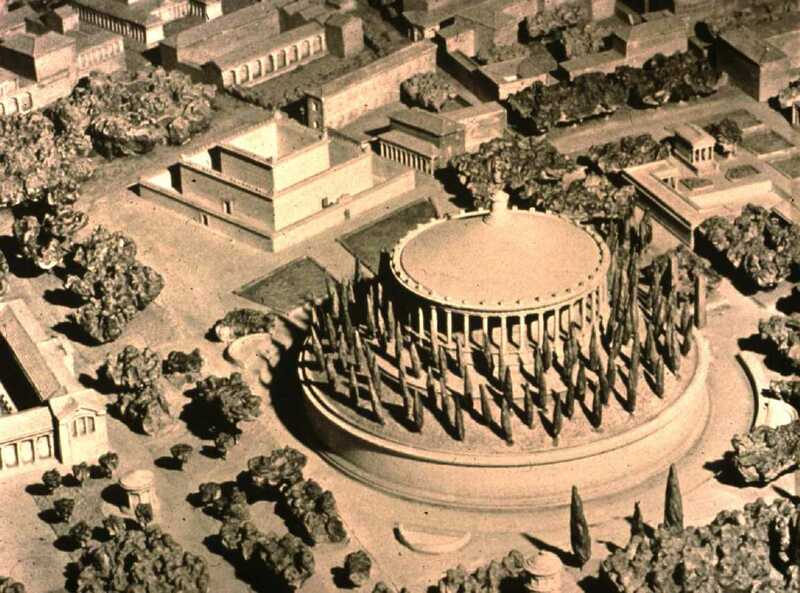 He planted cypresses on top of the walls in the mistaken belief that Augustus’ architects were as simple as he was, even though anyone who’s ever even seen what trees and vines can do to buildings would have realized this was an incredibly dumb idea. The Mausoleum never recovered from that disastrous “restoration.” It was closed to the public in the 1970s because it was structurally unsound and dangerous. For decades it has been a crumbling shadow of its former self, a virtually unknown and unrecognized ruin in the middle of a wide Fascist-era piazza, shelter to homeless people and junkies, used as a litter receptacle by passersby. This entry was posted on Wednesday, May 3rd, 2017 at 11:01 PM	and is filed under Ancient, Modern(ish). You can follow any responses to this entry through the RSS 2.0 feed. You can skip to the end and leave a response. Pinging is currently not allowed. Marvelous news for the “I, Claudius” monument. “Look on my works, ye mighty”: if it were left in its present state it could be viewed as a salutary warning to vainglorious politicians. whereas Mussolini is remembered for having messed around with the Mausoleum and his remains were hung upside-down from the rooftop of a petrol station. Apparently, the more you mess around elsewhere, the more your ‘vanitas’ is vain (or vice versa). augustus was kind of a prick who unknowingly set in motion 1900 years of autocratic rule in europe so yeah screw him.